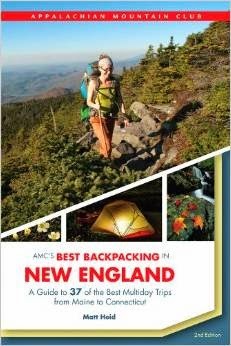 Earlier this spring, AMC released the 2nd edition of my guidebook, AMC’s Best Backpacking in New England. The revised edition features 37 trips across the region, each one of which was researched in the field to ensure the most up-to-date information and accuracy. Here are the crucial items I carry specifically for researching while in the field. In order to track total elevation gain and loss, as well as indicate the elevation of key landmarks such as trail junctions and overnight shelters, I always wear (and constantly reference) a wrist altimeter. 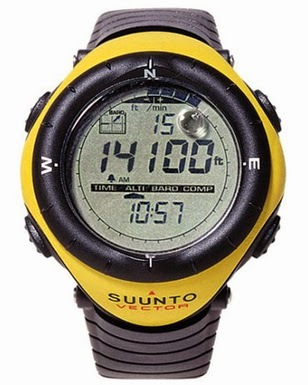 Remarkably, I still use the same altimeter watch I purchased more than 15 years ago: a bright yellow Suunto Vector (exactly as pictured). While a slew of newer models are available, my Vector has continued to perform admirably, reliably, and accurately over the years. Like any barometric altimeter, its readings fluctuate from day-to-day (and sometimes even over the course of a single day) as barometric pressure rises and falls. For this reason, I always calibrate at the trailhead before I start, double-check at known elevations (summits, marked landmarks, etc. ), and adjust as necessary. I carry this in one hand for the entirety of any research hike and constantly flip it open to jot down notes as I go. Having the map right there makes it easy to refer to regularly throughout the hike. One of the most important features of the clipboard is that, once folded, it keeps my paper dry even in wet and rainy conditions. Like my Vector watch, I have been carrying the same clipboard for more than 15 years. Remarkably durable, it has even survived being launched off the roof of my car (whoops) at 30 miles per hour and smashing into a rock on the roadside. These days any number of cameras will work fine for taking guidebook-quality images. The only crucial feature is being able to carry it in such a way that you have easy and instant one-hand access to it. 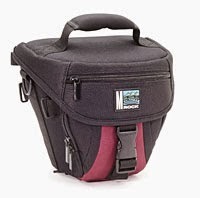 I carry an older Nikon D50 SLR with a standard 28mm to 70mm lens and keep it at the ready in an M-Rock carrying case slung over my shoulders with a single strap. The key camera case feature is being able to open and close it one-handed, which requires a clip rather than zipper closure. This allows me to quickly take photos one-handed while holding my clipboard in the other hand. I know some guidebook authors carry a voice recorder and take audio notes as they hike. While this may save time in the field, I’ve found this to be a far less efficient method for later transcription than working from written notes. So I use good old paper and pen. Simple 8.5″ x 11″ copy paper plus a basic ballpoint pen works the best for me. I definitely avoid ‘roller ball’ pens where the ink flows out with much less pressure than a classic ballpoint—the ink smears badly if the paper gets wet at all. The classic Bic Papermate pens work great in blue or black. The 2nd edition of Best Backpacking is the first version of any of my guidebooks that features GPS coordinates for key landmarks, including trailheads, shelters, and mountain summits. While many of the coordinates were provided by members of the Best Backpacking Group in the field, I verified these—and added new ones when necessary—using a USGS topographic map overlay on Google Earth. Adding GPS coordinates, however, adds a considerable amount of work to the process and I would be very interested in feedback from readers on how useful this information is, whether you have ever used them, and if you think them to be a worthwhile edition to this and future guidebooks. Thank you to the members of the Best Backpacking in New England Group: Wendy Almeida, Hugh Coxe, Kristi Hobson Edmonston, Dan Eisner, Paul Gannon Jr., Samantha Horn Olsen, Carey Kish, Rene Laubauch, Colleen MacDonald, Kim Foley MacKinnon, Jennifer Lamphere Roberts, Jeff Ryan, James Vittetau, Philip Werner, and Cameron West.